InFocus has created a nifty little projector, the InFocus Work Big IN1102, and designed it to include features with a traveling presenter in mind. Think about it - what do traveling presenters need? Portability, brightness, and ease of use. The IN1102 meets all of these needs. Its well-conceived design shows attentiveness to the needs of the mobile user. The IN1102 is an excellent example of a product whose form and function is perfectly tailored to its intended use. Brightness. The stated brightness of the InFocus IN1102 is 2200 ANSI lumens in High Brightness (HB) mode and 1650 lumens in Eco Mode (Eco). Our testing in its brightest presentation configuration measured 1712 lumens. Switching to eco-mode reduced lumen output to 1409, for an 18% drop. Both settings are bright enough to support "lights on" presenting on screens that are not larger than about 100" diagonal. Brightness uniformity measured 60%, which is below average for this class of projector. However, the eye's sensitivity to different brightness levels is not as great as one might imagine, so I did not find the unevenness of illumination particularly distracting. Resolution. The InFocus IN1102 is a native 1280 x 800 (WXGA) projector and I really appreciated how fluently it worked in its native resolution and at every resolution I tested. With video mirroring activated, the InFocus IN1102 was able to recognize and compress my MacBook Pro's proprietary 1440 x 900 output signal . With video mirroring turned off, it would even handle and compress a 1920 x 1080 signal, which is beyond the specs for the InFocus IN1102. Within each resolution and connection, it's easy to switch the projector's aspect ratio between auto, native, 16:9 (widescreen), letterbox or full screen. Getting the InFocus IN1102 to match your laptop or desktop's resolution should be a breeze. DisplayLink Technology. One of the nice features of the InFocus IN1102 is the inclusion of DisplayLink Technology. When the IN1102 is paired with a DisplayLink compatible laptop or desktop computer, it is able to make a video connection via mini-USB versus the standard VGA connection. It works by taking information from the graphics adapter, compressing it and allowing it to be sent over any standard network connection. In this case, it was a USB connection. I liked the functionality of the DisplayLink technology because it gives the user another video input that can be shared. Running computer-driven video through this connection was a little choppy but PowerPoint slideshows and software demo's were much better and met my expectations. Portability and Design. The word that best describes the InFocus IN1102 is "tight." That's a good word to describe a projector with four separate inputs that weighs only 2.75 lbs. There is not much wasted space inside or outside of the projector. There are no gaps in the chassis to allow light leakage. The IN1102 looks as good on a conference room table as the projected image looks on the screen. InFocus has done a good job incorporating attractive design and aesthetics on this model. Lamp Life and Fan Noise. Choosing between Hight Brightness and Eco mode will affect lamp life and fan noise level. In HB mode, InFocus says you should expect 3000 hours of lamp life, which is notably longer than the standard 2000 hours we find on many competing models. Dropping the IN1102 into eco mode will extend lamp life to 4000 hours. Despite its small form factor and high lumen output, the fan noise isn't as loud as you'd expect from a projector of this size. I did not find the fan noise objectionable except when trying to use the on-board audio. The minimal 1 watt speaker cannot compete with the fan noise with the lamp on full power. Better options are to use the audio on your laptop, or drop the IN1102 into eco mode to reduce the fan noise. Image Sharpness. The IN1102 delivers a sharp image from edge to edge. Many projectors in this class can have a portion of their projected image out of focus but I didn't see this problem on the IN1102. With keystone correction active, text looked a little softer than it does in native, uncompressed display, but not to the same degree as it does on some competing projectors. At one point, I forgot that I'd tweaked the keystone correction because the image still appeared sharp and clear. Video. The IN1102 does a good job displaying video from a computer or video source with or without the lights on. 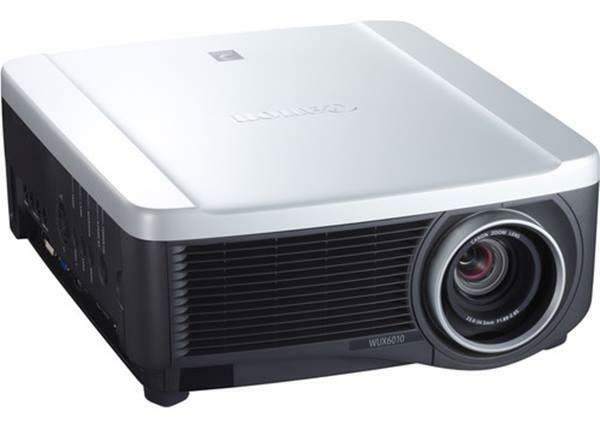 The IN1102 is first and foremost a presentation projector. Its video capabilities are a nice bonus. If you plan on extensive video display through the IN1102, a VGA to Component adapter would be a good addition and allow you to connect video sources up to 1080p. The IN1102 has TI's Brilliant Color on board. It can be activated or deactivated at your option. With Brilliant Color on, you get the brightest image possible, but color saturation takes a hit. If you are displaying video, high saturation graphics, or photography, you will get better color saturation and image balance by disabling Brilliant Color. Ease of use. The IN1102 is quick and easy to set up, and overall easy to use. My only issue was with the remote, which would be easier to use if the "select" button had been placed in the middle of the navigation buttons as it is on most remote layouts. My first introduction to presentation products 15 years ago was through an InFocus manufactured flat LCD panel display. I was thoroughly impressed then and that tradition continues with the InFocus IN1102 DLP projector. From ease of connectivity to image sharpness and aesthetics, InFocus seems to know what presenters want in a projector. The InFocus IN1102 gives me nothing significant to complain about. I do wish the image had more even illumination, but the image sharpness goes a long way to make up for this one issue. The InFocus IN1102 is a well-designed widescreen portable projector and an excellent choice for any mobile presenter. There are lots of white dots appear on the screen. Are these dead pixels? How to fix it ?